Imagine for a moment that you love basketball and you're a huge fan of Michael Jordan who is arguable the greatest basketball player of all time. And you ask Michael Jordan if you can hang out, shoot some hoops, and maybe play a little one-on-one. Would that be amazing or what?! Well, I had a similar experience of visiting with someone who is Michael Jordan's equivalent in the field of personal development - - I recently visited with Jack Canfield who is a world renowned expert at warming hearts and changing lives. Jack is, according to the Guinness World Book of Records, the best selling author of all time along with his coauthor Mark Victor Hansen - - together they created the Chicken Soup For The Soul book series. I interviewed Jack about his recently published book entitled The Success Principles - - How To Get From Where You Are To Where You Want To Be. It's a big book (470+ pages) - I own it in hardcover form and in audio form (download it now at audible.com) and I listen to it frequently. In this interview I focused my questions on one section of the book entitled "Build Your Success Team". Jack shared valuable insights including staying focused on your core genius, saying no to the good so that you can say yes to the great, and mastermind principles. After the call Jack and I visited offline for 15 minutes. I told told him he was very good at being interviewed (easy to interview). I guess that comes from being on so many radio programs (600+) and on TV so many times. He said "Tom, you're really good at this! You're calm and relaxed and have a natural style. You go with the flow and you keep bringing things back to focus. You're obviously living these principles and it comes through in the back and forth." I've got to tell you that after a compliment like that I felt like doing a few back flips. To receive such a kind compliment from one of my biggest heroes was a huge gift. Learning about (knowing) the Success Principles is not the same as applying them. When you become a member of the International Association of Teamwork Facilitators you join a community of like-minded professionals who are working to learn AND apply these life changing lessons Jack writes about. CLICK HERE to learn about all the IATF member benefits. Book Study Group: "Attractor Factor"
In November I posted an audio interview with Dr. Joe Vitale in which we discussed his best selling book The Attractor Factor - 5 Easy Steps for Creating Wealthy (or Anything Else) From the Inside Out. Starting Tuesday January 24 and running four weeks (4 Tuesdays), I will host an author approved book discussion group where we will explore the book and the Law of Attraction outlined in the book. We will be "meeting" on a telephone conference line (aka a "bridge line") from 10--10:55 PM Eastern (New York time zone). This is a great opportunity to be in the company of others who are learning and applying the information from the book. Come share your stories of success and realize new insights provided by the group. It will be magical. There is no charge to attend other than the fees your phone company charges you for long distance calls. You should also have a copy of the book - - you can buy the book at this link. Please read up to page 55 for the first call. To register for the call, send me an email. Space is limited. Have you ever played with a wooden table top labyrinth? You have two dials that cause the surface to tilt in any diretion - - this to make a marble move through the labyrinth without falling through a hole. The Team Labyrinth is like the table top game only better because it requires a team to play. The Team Labyrinth is made of fabric that accepts the "hook" side of Velcro. The team starts by building the labyrinth - - the walls are made of foam and have "hook" velcro on the bottom so they stick to the fabric. The "hole's" are made from "hook" Velcro (both sides) and will grab/stop the tennis ball size ball. Build a labyrinth and take it apart. Make it hard or make it easy. I used to build the labyrinth for the team but realized people have as much fun building it as making the ball go through. I use this activity to get a group looking at the obstacles to success and the strategies to succeed inspite of the obstacles. Here's a picture of someone who was just told they've got to participate in a teambuilding event. Does he look like someone you know? 1. Previous training events that were poorly designed and delivered (and people are tired of it). 2. Training event follow through / follow-up that was poorly designed and delivered. People tire of the lip service given to teamwork. They begin to see the time spent on teambuilding as a waste because there is no follow through. Nothing changes. 3. Wrong people on the bus - - i.e. the wrong people were hired and aren't naturally inclined to commit themselves to high performance (individually or as a team). This concept is shared in Jim Collins book "Good To Great"
4. Wrong company culture -- i.e. the organizational structure does not fully support a culture of teamwork. It doesn't matter how good the teambuilding program is, the company culture is such that nothing can be done to create a high performing team, short of a complete overhaul. How do you get beyond burnout"? The simple answer is to reestablish trust. Listen to this interview with Stephen M.R. Covey about trust. Before you plan a teambuilding event, make sure ALL systems within the organization support the team focus. Make sure you are going to follow through. Do a valid assessment of the team to make sure the training meets the needs of the group. When my six year old son started his swim lessons this winter the instructor first assessed his swimming skills. She does an assessment because without one she will have to guess as to his ability. If she starts teaching him as if he's never been in the water before he will get bored and he won't want to go back (he loves the water and loves to swim). When you start working with a fitness trainer the first thing she will do is assess your current level of fitness and then work with you to build your fitness plan to meet your personal health goals. Imagine the trainer giving every person who walks through the door the same fitness schedule. It wouldn't work! And it doesn't work with teams either. One of the team assessments I like to use was developed by Cynder Niemela who authored an outstanding book entitled "Leading High Impact Teams" (out of print). The assessment identifies the top 10 practices of high performing teams. This assessment helps me pin-point the issues I need to focus on with the team during the training and it also shows me where to provide follow up support. Download the_top_10_practices_.pdf This is not the assessment itself. The assessment is based on these 10 practices and it helps you determine where the team is strong and where the team is weak. One of the challenges for many trainers or educators who want to begin using an experiential approach to teaching team skills is dealing with the unknown. You may be new to teaching experientially and leading a team building game may be foreign to you. My degree is in education and most teaching is very controlled and predictable. When you teach through activities you must face the unpredictable. How will the group react? Will you remember the directions? Did you prepare all of the props the group will need? Will your boss or peers approve? Will it (the teaching methodology) really work? Which to do? Experiment (and risk) or play it safe? A couple of years ago I was playing in a lacrosse game (I play on a club team) and I received a lesson that has served me to this day and I think it speaks to this question. We were winning the game by one point. Our team had the ball in the offensive side of the field (I play defense) and there were 3 minutes left in the game. I called a timeout from the field because I wanted to convince the guys playing offense to just hold the ball and let the clock run out rather than going for another shot on goal and that's when I received the lesson. One of the guys looked at me and said, "Tom, you're playing not to lose and we are playing to win AND playing to win is much more fun!" He was right. It was a huge realization for me. Where else was I "playing not to lose" in my life? When I think back to the teachers (trainers, facilitators, coaches, etc.) who've had the greatest impact on my life I conclude that everyone one of them was "playing to win". They took risks. They extended themselves. They led by example. And they asked me to do the same. You may not know how to incorporate experiential training into your training event (or lesson) AND that just means you have a huge opportunity to extend yourself and "go for it". Be honest with your group. Tell them "Hey, I just learned this activity and I want to test it out. Would you be willing to give it a shot and then give me your feedback? I think it might hold great possibility for us." Yes, you will make mistakes if you play to win. In fact, you'll probably make some huge mistakes. And yet, playing to win is where you change lives. Playing to win is scary. And it will put a smile on your face. Here is a great team building game that uses simple props, is easy to transport (in your pocket) and is fun and challenging. You need at least 12 people (two groups of 6) to play this game. It's the perfect teamwork activity to help teams explore problem solving, creating messes, and cleaning up after others. CLICK HERE to learn more about all the IATF member benefits. I receive lots of emails from people who have problems with their team and they want to know how to fix them. The place to start with anything in your life (including problems) is to have gratitude. Be thankful for the situation you are experiencing. Know that the situation is perfect and so is your desire to change it. Whenever I experience some kind of difficulty -- whether it's locking my keys in my car or the sound system going out during my workshop -- I respond with gratitude. Responding in this way can be a challenge for me sometimes and yet this is my goal - - to respond with gratitude. Why would I be thankful for locking my keys out of my car? This is a tricky one. I'm not really thankful for locking my keys out of my car so much as I'm thankful for the lesson or gift this event brings me. You see, I choose to believe I am responsible for everything in my life (listen to my interview with Dr. Vitale) AND everything serves me in some way. I locked my keys out of my car while on vacation in Hawaii a few years ago. I called AAA to get my rental car unlocked and they said it would take an hour or two to get someone to the car (I was in a remote area). My wife and I decided this was a good thing and that there must be someone close by that we needed to meet. So we started looking. We walked in a couple of shops and then it happened. We had a great conversation with a shop owner who shared a secret place where sea turtles came in each evening to eat seaweed in a secluded bay. 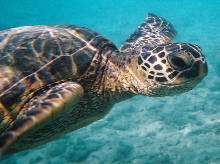 He encouraged us to take our snorkeling gear down to swim with the sea turtles - - and we did! It was pure magic. Had I not locked my keys in the car we would have never found out about the secret sea turtle snorkeling spot. Start with gratitude. Know that everything serves you in some way. Look for the blessing and you will find it.